Emond Publishing is pleased to announce that the third edition of one of our bestselling texts Youth and the Law: New Approaches to Criminal Justice and Child Protection is now available. The author team's knowledge and experience as academic writers and university and college instructors brings clarity and depth to this important and often controversial subject. The third edition has been significantly updated to reflect current theories and models of youth justice, as well as new discussions on common offences, risk factors, and societal responses to youth in conflict with the law. The authors present the complete process of dealing with youth and crime, from police procedures to the trial and sentencing to rehabilitation. Youth and the Law also examines statistics, reports from the field, and studies of programs introduced under the Youth Criminal Justice Act to present a clear understanding of law enforcement as it relates to Canadian youth. The text also includes real-life case studies to keep students engaged, as well as chapter summaries, key terms and definitions, and review questions that serve as a useful study guide for students. Reid, Susan, Bromwich, R.J, & Gilliss, Sarah. (2015). 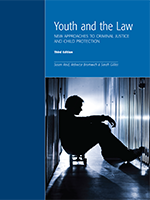 Youth and the Law: New Approaches to Criminal Justice and Child Protection. Emond Publishing.